Before I start painting, I thought I would do some digital color tests to give me a direction. I had originally envisioned a light background, but while playing with the image I settled on a dark tone instead. Now I’m ready to apply my first tone layer of color to the new painting. 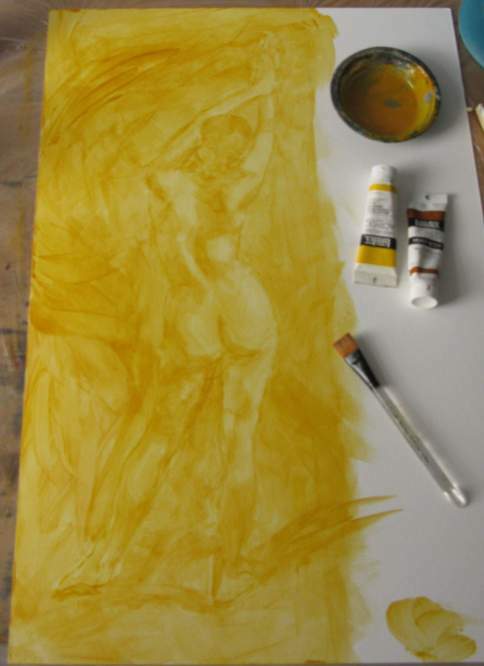 It’s a mixture of Liquitex Cadmium Yellow Medium Hue and Raw Sienna that has been thinned with matte medium and water. I first traced my pencil outline with just the Cadmium Yellow to help preserve the edges better before covering it with the thinned paint. I used a 1″ brush to restrict myself to large blocky shapes, and simplified values that are very close in a medium range. I got an impression while painting the background to echo the “S” shape of her figure with a shadow shape. I’m not sure I’ll keep that as I continue, but it’s something to work with. Well, I decided to make it a painting. I may also do a drawing of it later, perhaps in ink, but this will be an acrylic painting. I chose acrylic only because I haven’t painted with them in awhile, and the tubes are getting dusty. 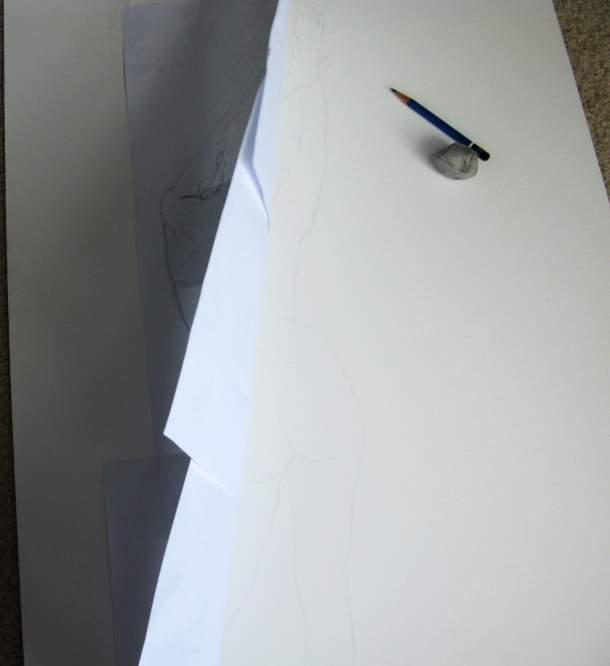 To transfer the sketch to the illustration board, I taped the left side of it to the board, and flipped it back and forth, drawing lines to match the sketch. This is similar to how animators do in-betweens. I like to use this method when I can instead of using transfer paper or rubbing charcoal on the back, since it’s faster and less messy. I’m drawing with a 5H lead very lightly, and slightly erasing the lines with a kneaded eraser, so it may be hard for you to see the drawing here, but that’s the intention. I only want faint lines at this point. The board, by the way, was prepared with acrylic polymer ground (aka “acrylic gesso.”) I wanted to reduce the absorbency of the paper and get it a little brighter. I thinned it down some and added a little bit of Golden’s GAC 200 medium to the mixture to stiffen up the board a bit. I didn’t measure it out precisely, but there’s approximately 1/3 water to gesso, and about a 1/3 medium to water by volume. I applied two coats on the front and one on the back. It’s a Strathmore 500 Series Illustration Board.  Elizabeth Stretches – Drawing or Painting? 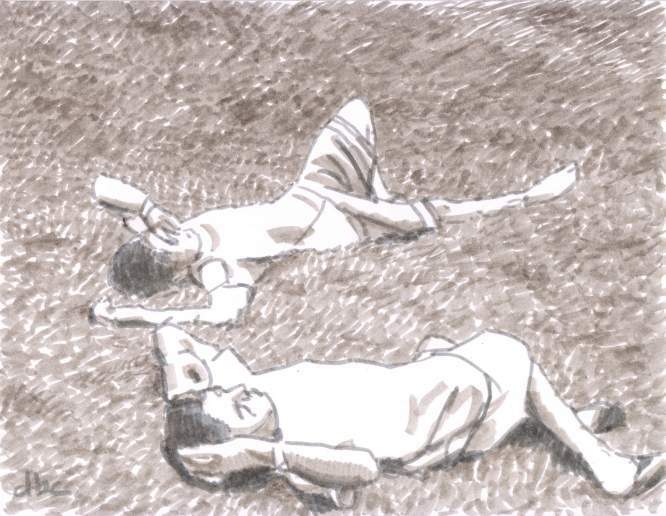 Here’s a recent sketch made with ink brush markers of two young boys laying on the grass. There’s a big water reservoir near my house with a small playground where kids hang out and play. 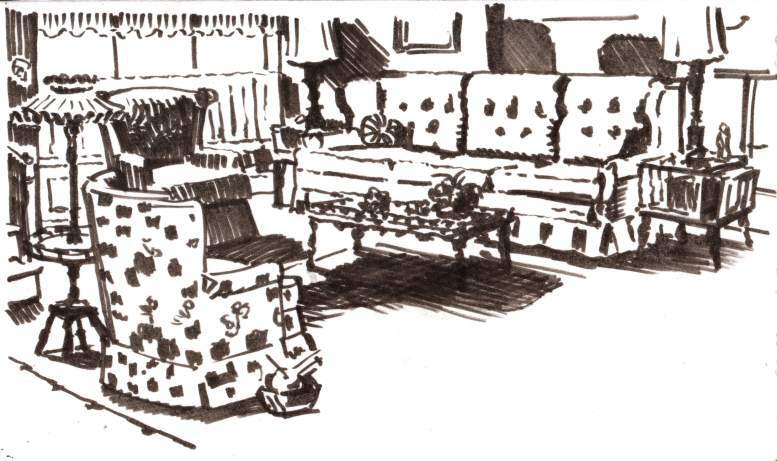 I visited my friends, the Collins’, over the weekend, and took a few minutes to sketch their living room. This 7 x 12″ drawn with a Pitt “walnut” ink brush. I thought of titling this “Nancy Drew,” but I think that name’s already taken. In pencil on 8.5 x 11″ paper. This is a sketch I made of my friend, Nancy, at a local museum. She was drawing a painting while I drew her. 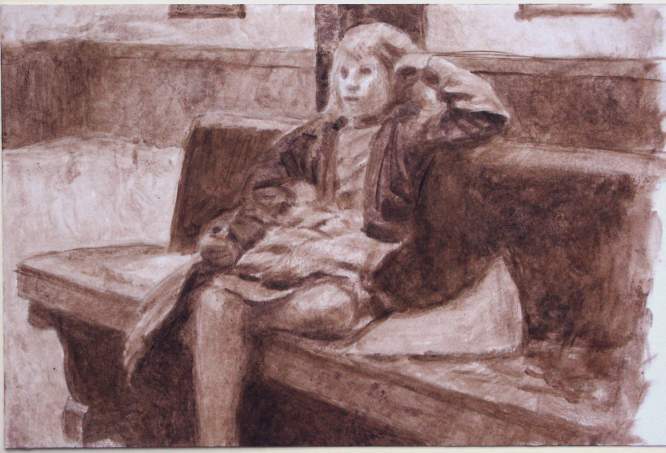 I made a quick outline sketch of her in pencil, and finished it later using thinned burnt umber oil paint. It’s on Multimedia Art Board, about 10.5 x 15 inches. You are currently browsing the Artwork by D. B. Clemons blog archives for June, 2015.